University of Georgia Press, 9780820348155, 272pp. Writers of the modern essay can trace their chosen genre all the way back to Michel de Montaigne (1533-92). But save for the recent notable best seller How to Live: A Life of Montaigne by Sarah Bakewell, Montaigne is largely ignored. After Montaigne--a collection of twenty-four new personal essays intended as tribute--aims to correct this collective lapse of memory and introduce modern readers and writers to their stylistic forebear. Though it's been over four hundred years since he began writing his essays, Montaigne's writing is still fresh, and his use of the form as a means of self-exploration in the world around him reads as innovative--even by modern standards. He is, simply put, the writer to whom all essayists are indebted. Each contributor has chosen one of Montaigne's 107 essays and has written his/her own essay of the same title and on the same theme, using a quote from Montaigne's essay as an epigraph. The overall effect is akin to a covers album, with each writer offering his or her own interpretation and stylistic verve to Montaigne's themes in ways that both reinforce and challenge the French writer's prose, ideas, and forms. 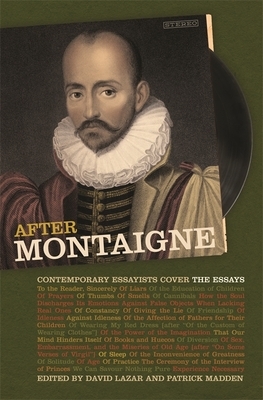 Featuring a who's who of contemporary essayists, After Montaigne offers astartling engagement with Montaigne and the essay form while also pointing the way to the genre's potential new directions. David Lazar (Editor) DAVID LAZAR is a professor in the Nonfiction Program at Columbia College Chicago and the editor of the journal Hotel Amerika. His books include Occasional Desire, The Body of Brooklyn, and Truth in Nonfiction. Patrick Madden (Editor) PATRICK MADDEN is an associate professor of English at Brigham Young University and author of Quotidiana and Sublime Physick. His work has appeared in the Iowa Review, Portland Magazine, Fourth Genre, and the Best Creative Nonfiction and Best American Spiritual Writing anthologies.